Malware distributors are always looking for ways to circumvent security and push their malware into users devices. Often popular apps and software will become launch vehicles for these malware. Instagram, once popular iOS only app and later debuted to Android and now acquired by Facebook is now getting the attention of scammers. 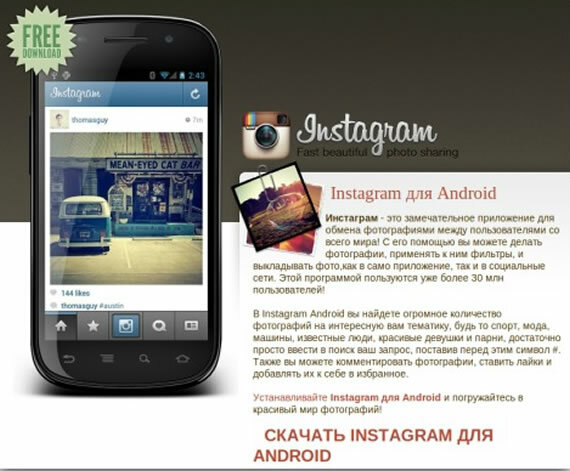 Security firm Sophos alerts us that malware authors are distributing fake Instagram app for Android with malware in it. Android users waited for the Instagram app to be released for their smartphones, soon after the release it was downloaded by 1 million times in less than 24 hours and later the Facebook acquisition. and this has raised Instagram popularity to new high levels and attracted the scammers. Sophos points out to a Russian website that is distributing the fake Instagram app with malware in it, they identified the malware as Andr/Boxer-F and it is a SMS Trojan horse. If you download and install the app it tries to send SMS messages in the background to earn revenue for its author. Android malware is a big problem for Android smartphones. Apple has strict approval process for apps that go into its appstore. Google on the other hand is not so strict, that is great one way because it becomes more open and I can decide what apps I want for my phone not Google or Apple decides for me. But this will open door for malicious behavior from scammers. Google has a security feature dubbed as Bouncer to keep malware out of Google Play store. So be careful when you are downloading Android apps, only download apps from Google Play store or from other trusted sources like your phone manufacturer store.